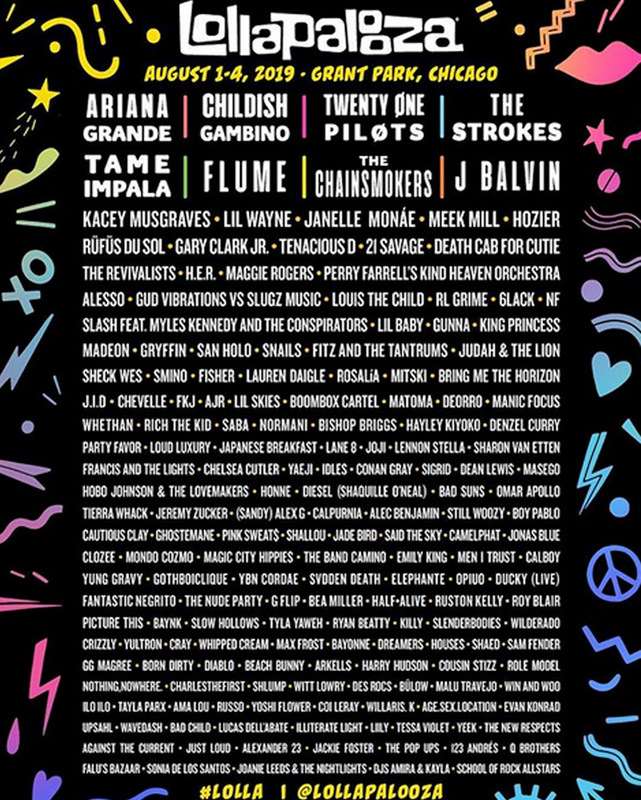 After teasing the first round of performers yesterday (March 19), Lollapalooza has unveiled the full lineup for its 2019 instalment. Ariana Grande, Childish Gambino, Twenty One Pilots and the Strokes top the bill. Also performing are Flume, the Chainsmokers, Kacey Musgraves, Meek Mill, Hozier, Rüfüs du Sol, Gary Clark Jr., 21 Savage, Death Cab for Cutie, Maggie Rogers, Mitski, Bring Me the Horizon, Normani, Sharon Van Etten, Arkells and plenty of others. They join the previously revealed Tame Impala, Janelle Monáe, Lil Wayne, Rosalía, Yaeji, J Balvin, Tenacious D, Slash (of Guns N' Roses), Gunna, Calpurnia, Lil Baby, Lil Skies and Madeon. Lollapalooza will take over Grant Park in Chicago from August 1 to 4. Find full festival information over at the Lollapalooza website.